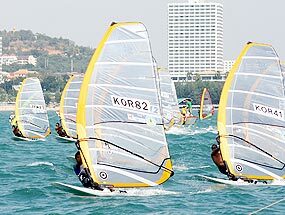 More than 600 international windsurfers are setting their sails for Jomtien Beach for the Pattaya International Windsurfing Championship 2008 to be held on November 28- December 5 at the water sports field. The International Windsurfing Association (IWA) and the International Sailing Federation (ISAF) have approved Thailand as the host for the competition to be sailed mainly by Asian windsurfers. Pattaya Deputy Mayor Verawat Khakai chaired a meeting to organize the event, attended by Pattana Bunsawat, Secretariat of the Windsurfing Association of Thailand, Niti Kongkrut, Director of the TAT Pattaya Office on October 29 at Pattaya City Hall. Competition events on the card are: Pattaya City RS:X Asian Championship, RS:X Asian Youth Championship and Pattaya City International Mistral Regatta. The event is divided into categories for men, women and youths. Pattana said windsurfing associations in Asia had confidence in the Thai association’s ability and choice of location for the competition and as the association had previously already hosted a world championship, so the international windsurfing bodies chose Thailand again. “This competition will upgrade Thai windsurfers’ abilities to reach international level and will help to develop the Thai national windsurfing team,” Pattana said.